After graduating this past May from NYU, I decided to go to China to visit some friends who were also graduating, but from NYU Shanghai! I took this visit as an opportunity to backpack across China, and this post is an account of my adventures- including all the highs and lows along my journey. Hopefully, any other first time, solo, female backpackers in China can use this as some kind of reference guide for their travels! A very important factor in my travels is the fact that I did this alone, as a female, American, foreigner of Indian descent. Although I didn’t think this would be a big deal before going out from Shanghai onto my adventure, I would soon realize that my physical identity would shape my entire journey. Because I was by myself and it was difficult to get tickets for some of the local attractions, I decided to book a series of tours throughout my trip. Although this could be considered a cop out, I was happy I chose to go this route on certain occasions because- especially in the case of the Great Wall- I wouldn’t have even known to visit the places I did without the tour guide taking me there. Yet, on other occasions this wasn’t entirely worth the cost (specifically the Xi’an tour). Another important factor to note is that I did ALOT of planning before heading out to China. I created two possible backpacking routes with the help of Chris (my best friend in Shanghai who I would be staying with), Jess (my Malaysian-Chinese roommate), and Pinterest. Here are links to the Google Spreadsheet I made with the different itineraries and the Pinterest board I used for inspo. As you can tell by the subtitle to DAY 2, I tried to pack ALOT into this day. Honestly, it didn’t feel like a lot, and I didn’t have bad jet lag so it was very much doable. I started my second day in Shanghai going to the NYU campus with Chris. We grabbed coffee from Starbucks and took the subway to campus. Honestly, the Shanghai subway system is SO NICE! It’s easier than the subways in New York, with very clear signage and easy to understand systems. We got to campus in like fifteen minutes, and Chris gave me a tour. So when I say “campus,” I mean one skyscraper-like building off of a main boulevard. The building looked like it had been transplanted from Washington Square Park into Shanghai. After giving me the grand tour, I took advantage of my Wifi access to book all the tours and trains I had planned for the next week and a half. Then Chris and I had a quick lunch in the cafeteria and he went for his final class presentation while I took the opposite subway and went to Yuyan gardens. I used google maps to navigate the way I was going (I have T-mobile, which is super convenient because for $2 extra per month you have unlimited data world-wide, so your phone connects to the local service and you can use it anywhere in the world). Unfortunately, google maps wasn’t entirely accurate and I ended up wandering the streets for a little while when I left the subway station- fortunately, the streets were gorgeous. The area around Yuyan Gardens is known as The Old City for its classical Chinese architecture. Yet the stores inside were a mix of local and modern ranging from fake brand name purse stores to McDonalds and Haagen Dazs. I followed the street signs till I got to the garden and paid the extra 40 yen to get in- it was so worth it! The garden itself used to belong to some emperor, and they preserved the area keeping the temples and foliage the same. This experience was also great because it showed me more of what I had expected China to look like vs. the area around the NYU Shanghai campus which looked annoyingly similar to NYC. After Yuyan gardens, I took the train to meet up with Chris’ cousin Amy and her boyfriend Brandon at The Propaganda Museum in the French Concession. I got thoroughly lost post exiting the subway stop- The French Concession is this district in Shanghai marked by winding and confusing roads, and Western architecture left behind by the Western colonial powers. A lot of expats live in the area now. Amy called me and we decided to meet at a specific cafe which I somehow found my way to eventually. She said it was hard to find the actual museum so after meeting up we walked there together, and then I understood why. This museum is a literal basement of an apartment building. A man had collected these propaganda posters throughout his life and made this little display of them. It was super cool to see the posters because they outline Chinese history, politics, and culture. But, it is a fairly small collection so we were able to finish this stop pretty quickly, from which we decided to chill around the French Concession. We spent our evening around the area and chilled in a wine garden, a beer garden, and then a restaurant called Black Bird (named after the Beetles). It was super fun, but also a pretty pricey night seeing as prices in the French Concession are comparable to that of New York. Chris’ apartment is super close to the French Concession, so we decided to go back and meet him there before heading out to a NYU seniors house party. Overall it ended as a super chill night. Day 3 Chris had to go to his internship, so I started the day meeting up for lunch with Jake, one of my friends from NYU Tel Aviv. He works close to People’s Square so I took the subway to that station and walked around the area for a bit before settling in a Starbucks to meet up with him. He took me to a whole in the wall local food place, and we ordered some fried rice and some veggie side dishes which I would continuously see popping up throughout the trip- especially the potatoes <3. One thing I should note is I am a vegetarian, so for the first couple days of my trip I would go for meals with friends who knew how to speak Chinese so they could help me navigate the menus. After Lunch, Jake recommended that I take East Nanjing Road down to The Bund– kind of like the Brooklyn Bridge Park but for Shanghai, because of it’s amazing view of the skyline. East Nanjing was super cool because it’s basically like a long street version of Time Square, with massive brand name stores ranging from Forever 21 to Louis Vouton, and insanely over-the-top lights (which weren’t lit because it was still the day time). At the end of the street was the Fairmont Peace Hotel, this fancy hotel that reminded me a lot of the Plaza Hotel. I snuck into the rooftop balcony area to take a panorama before being escorted out for not being an actual guest of the hotel. From there I went to the Bund and got some amazing shots of the skyline, walking the whole length till the end where the ferry ride is, which I decided to forego to meet up with Chris’ boyfriend at the M50 museum- a contemporary art museum known for their interactive exhibits. This is when the whole foreigner thing started to become super annoying. So in order to get to the museum I needed to take a Taxi, but I was unable to get any Taxi’s to stop for me. I tried moving around and hailing them from different spots around the Bund, but the drivers would make eye contact and just keep going past me. Finally, I got a couple to stop for me, but when I showed them the location in a mix of English and Chinese, they said no and drove away. I finally asked Chris’ boyfriend, Michael, to come meet me by the Bund and when I told him this story he was sympathetic, noting that this was a common occurrence with taxi drivers and foreigners in Shanghai. Ugh. Michael then decided to take me to Tianzamen– a little neighborhood in Shanghai that I think was my favorite section of the city. We took a subway from the Bund to a stop “close” to Tianzamen and then walked a long way till we got there, but it was so worth it. The walk through the city was nice, but also the neighborhood is a series of alley ways with tiny pop-up kind of shops. It’s a super cute, and super touristy market kind of area. We immediately b-lined to this food spot Michael frequented in the neighborhood where you pick out meat and veggies from these fridges and give them to the cashier to cook together with noodles, broth, and spices- kind of like a DIY ramen situation. The food was super delicious, cheap, and easy to get vegetarian! After eating we walked around the little shops, looking in at the souvenirs and such. This area is great for getting unique souvenirs and superhero/anime/character fan stuff, but it’s also pricey for China- Beijing ended up being a lot cheaper for generic China souvenirs. After Tianzamen, Michael and I met up with Chris close to campus, where we all chilled in a food court. China also has a super huge mall culture with very large and diverse food courts- deff worth checking out! Michael and I had dessert while Chris had his dinner. After Day 3, I kind of felt like I had done Shanghai and was ready to go see more of China, so for Day 4 I decided to go visit my friend Grace in Hangzhou! I decided to take a train from Shanghai to Hangzhou the morning of Day 4. I used Ctrip– a website used for traveling in China- to buy the tickets from Chris’s apartment. I ended up having to buy a business class ticket for on the way to Hangzhou, but it was on sale so it wasn’t too expensive and I didn’t mind. I left Chris’ apartment like two hours before my train left, and I took the subway to the railway station, which took me like an hour. Little did I know that picking up my ticket from the station was going to take almost 45 mins- from getting from the subway exit to the ticket pick up station, to waiting in the pick up line (foreigners have to get tickets from the ticket booth and can’t use the automated machine). I ended up getting so close to missing my train that I switched to the “CHANGE TICKET” counter. When I went to ask the counter lady to switch my ticket to a later time, she actually printed my current ticket and I ran to the gate, narrowly making the train. When I got out in Hangzhou, I found the designated Taxi area (I learned my lesson in the airport), got in a Taxi and showed the cab driver the address Grace had sent me and went on my way. I assumed that the cabby knew where he was going from showing him the address which Grace had sent in Chinese, so I didn’t understand it. As we drove through Hangzhou and I became hypnotized by the beautiful lake scenery. The cabby finally dropped me off, but he had left me at a building that was breaking down and had a couple of dogs circling it. I walked around looking for Grace and quickly realized I wasn’t in the right place. A man came out of the building and pointed to the street saying “taxi, taxi,” so I went back to the street and hailed a new cabby who finally took me to the right place- moral of the story, make sure you’re extra aware of where the cabby is dropping you off before getting out of the cab! I met up with Grace at her hotel and we immediately went into the main part of Hangzhou to get food. I told her I really wanted veggie dumplings and she found the best place in the city according to a Chinese Yelp app. THESE DUMPLINGS WERE STRAIGHT FIRE! I have no idea what the place was called unfortunately, but it wasn’t even the place that was so amazing. In China, they make the dumplings fresh so you can see the cooks in the restaurant rolling out the dough and filling them with fresh ingredients! It makes the dumplings just so fresh and delicious! After dumplings, Grace took me to get a Hong Kong coffee– I was still kind of jet lagged so I was drinking lots of coffee! Hong Kong coffee was great because it’s super strong and a little bit sweet. It also reminded me of a much better version of the canned coffee I had been getting in the subway vending machines and railway stations- not the best coffee but deff an experience lol. Grace and I then went back to the lake and rented bikes from her hotel to ride around the lake. We went down this path that goes straight through the middle of the lake. It had gorgeous views with weeping willows, lotuses, pagodas, and boats <3. After riding around the lake, Grace got in the car with me and we headed to the railway station for my train back to Shanghai. When I went to pickup my ticket, the ticket person said my passport number didn’t match what had been inputed. Turns out, in my hurry to book the ticket, I had accidentally put my credit card number instead of my passport number… (classic Preethi move smh lol). Luckily, Grace was there to talk to the ticket person for me because the ticket lady did not understand English. Grace said that the lady had a ticket for four hours from then but, I had to be back in Shanghai in a couple of hours for the NYU Shanghai Pearl Tower Lighting Ceremony. There’s not much to say about Day 5 seeing as I was focused on Chris’ graduation. I met Chris’s boyfriend, Michael, at the NYU Shanghai building and we quickly biked over to the Shanghai Center for Arts and Culture. We got separated during the ceremony due to assigned seating, but afterwards, we all met up and walked back to the NYU Shanghai building with Chris and his family to take pictures and enjoy some light refreshments. After the graduation festivities Chris headed to a flight to Vietnam for his vacation, while I boarded an overnight train to Beijing, and hence the start of my solo adventures! The overnight sleeper trains in China are notorious for being safe and cramped. There are security guards walking up and down the cabins all through the night. This first overnight train of my trip turned out to be the best- I had booked a soft sleeper ticket without knowing that it would be significantly nicer than the hard sleepers I would be taking for the rest of my trip. The soft sleeper has four beds- two bottom and two top, in a small room area with a closing door and a window. Each bed has it’s own outlet, pillow, sheets, blanket, and a shelf to put all of your stuff into. I was in a room with a new mother, her newborn baby, the baby’s grandmother, and another random lady. I’m not sure if the all-female cabin was intentional or not, but it only happened during this train ride. Overall, this train ride was super nice and I felt comfortable the whole time. I highly recommend taking soft sleepers for anyone who wants to feel extra comfy and safe as they travel! So I said this would be the start of my solo adventures, but honestly I was only “solo” during my train ride into Beijing- and even then, I kind of made friends with my bunk mates (kind of because they didn’t now English and I didn’t know Chinese but we were all smiling at each other and giggling so that means we’re friends, right?). As soon as I got off the train, I headed over to the designated Taxi area (I know, I know, I’m so travel savy at this point 😉 ) and I showed a cabby the place my tour guide said to meet up at. I had booked a guided hiking/camping tour for the Great Wall of China. I called the organizers ahead of time to tell them I would be coming directly from the train and they were super helpful in giving me info about how to get to the meeting place via Taxi instead of Subway because the Subway would take too long. The cabby dropped me off at the wrong spot (yet again), but it was close enough to where I was supposed to be that I was able to find my way. I was met by Fred, the man who runs the tours, and Rob, our New Zealand tour guide, and we waited for the other tour participants- a group of Germans, a Malaysian family, and a foreign exchange recent high school graduate from Alaska. Let me just say right here, that this tour was AMAZING. Totally worth every penny, and one of the best experiences of my life by far. We got into a mini bus and headed toward the mountain. Rob gave us a quick brief about how we would stop in a little village for food and then climb to the top of the wild part of the wall, set up camp, spend the night, and head back down. I was worried that I would have issues, being a Vegetarian and all, but the food was great and super vegetarian friendly! What was not so great was the bathroom- definitely be ready for some stinky, hole-in-the-ground bathrooms in Beijing. We ate Lunch, sat around for a bit to let our food digest, and then we were off! We took the bus to the beginning of our hike, where we were given backpacks with tents, water bottles, optional hiking sticks, and sleeping bags. I added my tooth brush, mouth wash, sweater, sweat pants, and a couple snacks. And up we went! And let me tell you. THIS WAS NOT AN EASY HIKE. It was SOOOO worth every grueling step it took to get to the top, but it was not easy! The mountain is pretty steep, the hike is pretty long, and my backpack was unnecessarily heavy. But the views at the top were INCREDIBLE. I’m still in awe at the fact that I literally got to spend a night on top of the Great Wall of China! We got to the top of the mountain and pitched our tents inside a tower. The tower had two levels- a top and a bottom. Most of us pitched our tents on the top, which we later regretted due to the super rainy night. We had dinner at the top, which was provided by our tour guides, and walked around the wall taking in the sights. After dinner some of us stayed up a little later chatting, and eventually we all went in to our tents for early nights, exhausted from all the climbing. I woke up at 4:30 am on the Great Wall, hoping to get a glimpse of the sunrise. I had used my phone for an alarm, charging it with Michael’s charging bank (BLESS MICHAEL FOR THIS CHARGING BANK <3). When I got out of my tent, I realized I wouldn’t be seeing much of a sunrise. The sky was still too cloudy, and it was still raining. Yet, I sat and waited with a couple of other people from my group, watching the world come into motion as the clouds slowly swept away and the birds began chirping. Although I didn’t see the gorgeous colors of a sunrise (most tourists miss this because of the pollution from Beijing), I was happy to experience the world waking up from the peak of the Great Wall. After sitting for a bit, I went back to sleep and officially woke up at 7:30 am. I brushed my teeth, sitting on the edge of the wall (lol), freshened up, ate one of my snacks, and packed up all of my gear. Once everyone was ready, we headed out towards the opposite end of the wall from which we had wandered the night before. This opposite end was INSANELY STEEP. I do not do well with stairs (I fell down a big flight in middle school). With a massive backpack on, I had to steady my balance and carefully climb down the stairs till we got to a whole in the wall where we got down onto the path down the mountain. But, even with my fear of stairs, going down the actual mountain was a lot easier than climbing it, and we were at the bottom in half the time it took us to go up. Once at the bottom, enjoying breakfast at the same little village we had had lunch the day before, Rob reminded me and the Malaysian family that we had another hike booked for the same day. I hadn’t realized when booking the tour that I had booked two separate hikes and after how difficult the first was, I was really questioning going through with the second. But, the Malaysian family, who had been immensely struggling the whole way up the first hike, decided to do the second one. I couldn’t back out now, and honestly, I am so insanely happy I didn’t. The second hike was SO much easier without the camping gear, and the views were INCREDIBLE. So worth the struggle. After the second hike, we had dinner at another village at the other side of the base of the mountain. Then our tour guides took us back to Beijing, from where I took the subway to my hostel (…). Honestly, I thought getting to the hostel would be easy, with google maps and all the signs in English I overestimated my preparedness. After getting out of the subway stop directed by google maps, I quickly realized the app wasn’t tracking me properly and was rather sending me in circles, telling me I was on streets I wasn’t. Luckily, the hostel was super helpful. I called them and they told me to give my phone to a Chinese person on the street, which I reluctantly did, and then they told me which direction to go and what landmarks to turn at. From there it was an easy way to the hostel! After spending the last two days hiking, I was down for a chill day in the city. One of the girls I’d made friends with the night before, Rebecca, and I had planned to head over to the Forbidden City together. After waking up and getting ready, I decided to wander around the city a bit before meeting up with Rebecca. I got a random pastry from a popup shop (IT WAS AMAZING <3) and an iced latte from Starbucks, then I sat down and tried to figure out how to get to the Forbidden City from where we were. I went back to the hostel and met up with my Chinese roommate before she left Beijing, and she gave me recommendations for local vegetarian food. We said our goodbyes and thank you’s and I headed out to meet up with Rebecca. Rebecca is another solo female traveler. She is from Scotland and graduated from college a year before, spending the last year of her life working and saving up money for her current adventure- backpacking across all of South East Asia in four months. She had just come into Beijing the night before from Tokyo, Japan. It was super cool and inspiring to spend the day with her, going through the Forbidden City, eating buns in the old city, and wandering around the little markets/stores. She told me about her adventures in Japan and South Korea and I was so happy to know that there were other girls doing this! BY THEMSELVES! After our adventure, wandering around the old city/super touristy part of Beijing, Rebecca went back to the hostel while I went to the bank to exchange the rest of my USD before heading deeper west into China. This is important to note- the ICBC bank that the hostel recommended wouldn’t exchange my USD because it was “damaged” (folded corners, marker marks, little tears on the sides). I ended up having to go to the Bank of China to have my money exchanged because it was the only bank willing to do so. After exchanging my money, I jumped on the subway and headed to the railway station- giving myself enough time to pick up my train ticket. This train was different from the last train I took because it was a hard sleeper. One of the guys in the hostel warned me about these because they were three beds stacked on top of each other, with very little room to move. Yet, I decided to go along with my ticket just for the experience. He was right- the beds were stacked on top of each other in very narrow quarters. Unlike the soft sleeper, the sections of the cabin weren’t like little rooms with doors and shelves and outlets. These were simply sectioned off into sections of six beds each, connected directly into the main hall of the cabin, and with a single shelf shared by everyone. There were no outlets at all. I lucked out in this ride as well, having an elderly couple at the bottom set of beds, a young man and woman on the second set, and me and another young woman on the top. Everyone was super friendly and I read my C.S. Lewis book as I laid in my top bunk, not being able to sit up all the way without hitting my head on the ceiling. When I got off at the central Train Station in Xian, I was met by my little Chinese tour guide. I had booked a two day private tour for Xian, the Terracotta Warriors, and Mt. Huashan, as my friends had warned me about the difficulties of getting tickets for tourist attractions. Honestly, this tour did not feel like it was worth the price. The tour was extremely expensive and I felt that I could have gone to the attractions by myself- yet it was entirely worth it at the end when I was having issues with my train to Chengdu and my personal tour guide helped me figure things out using her Chinese (More on this in DAY 10). Anyways, the tour started with me meeting Ivy, a little Chinese women who spoke pretty fluent English-very practiced. She immediately decided I needed breakfast, but that local food wouldn’t be good for my Western tastes, so she took me to a Chinese fast food chain. When I told her I was a vegetarian, she order me fried dough sticks, with a coffee I had pushed for. It’s important to note that unlike the last tour, this tour was more expensive and did not include all meals- only one. This was not that one. Ivy then took me to our private car. The car was a nice, new, air conditioned, stocked with water bottles, black car. Being driven around by a driver in a nice car like this for two days was kind of worth the cost of the tour as well ;). We drove to the Muslim street, where Ivy took me through to see the local Muslim population and their unique cuisine. It was an interesting/yummy beginning to the tour. After spending like fifteen minutes, here we headed over to the city wall. Xian is an interesting city, with it’s main attraction being the preserved city wall. The wall has been reconstructed and is a very wide, raised, platform where tourists now bike around, taking in views of the city. Ivy led me to the top of the wall where I rented a bike (also not included in the tour), and biked around the entire wall. The view was gorgeous and it was refreshing to be active again. When I was done biking the whole wall, I met up with Ivy who took me back to the car. We then drove to the terra-cotta warriors museum- a museum created by the Chinese government outside of the actual Terra-cotta warriors exhibit, to show tourists how the warriors were created, and which I ultimately found to be a glorified gift shop. Ivy then took me to a restaurant where I had the lunch provided by the tour at a fancy restaurant filled with other foreign tourists, inside the grounds where the terracotta warriors were. After eating lunch, we went to see the warriors! It’s important to note that this area is INSANELY TOURISTY. The government has literally built a tiny town/tourist park around the terracotta warriors. Going to see the warriors was pretty cool because it’s like seeing something from your history text books in real life. Ivy was a great tour guide and was explaining all the history and details of each section. Yet, I was annoyed by the commoditization of the attraction. After seeing the warriors, Ivy took me to a building where the farmer who had discovered the warriors was sitting and signing copies of his book which he was selling right there. This had literally become this farmers career- signing books. Although an arguably better outcome for this man, I was definitely annoyed with how much of a tourist trap the government had turned such an important piece of history into. After seeing the warriors, Ivy took me back to our car and our driver drove us to the base of Mt. Huashan. We were staying in a hotel for the night in the village at the base of the mountain. After arriving at the hotel and sending me to my room, Ivy and the driver decided to scout out the village for a good place to get dinner. I settled into my room, which was very dusty and definitely hadn’t been used in a long time, then went for a simple, local dinner with the two other women. The dinner was great, and it was nice to have company in this pretty backwaters village. After dinner, Ivy and I walked around the area a bit and then went to the grocery store to stock up on snacks for my big climb the next day. The next day started with a free breakfast in the hotel. I ate by myself, because Ivy and the driver had eaten before I got to the lobby. After quickly scarfing down what I could recognize to definitely not have meat in it, I met the two other ladies in the lobby and off we went! The driver dropped Ivy and I off at the Mt. Huashan tourist center, where Ivy got her and I tickets for the shuttle bus to the lift, tickets for the lift to one of the mountain peaks, and tickets for the mountain itself. Mt. Huashan is an important Chinese landmark and Taoist sacred space. We started at the Western Peak, as Ivy said it was an important sacred peak I had to see, even though all the bloggers I read online had said starting from the West Peak would mean an entirely uphill climb. At the peak we split up, Ivy waited there while I headed for the South Peak, my eyes set on the Plank Walk. The Plank Walk is one of the most dangerous walks in the world- at the South Peak are planks nailed into the side of the mountain. A thin, two way “path”, with people climbing over each other, and optional harnesses you have to pay for. I made it to the top of the Southern Peak after climbing up the extremely steep “Stairway to Heaven.” Exhausted from the climb, I drank some water and ate a quick snack before heading over to the Plank Walk. Idk if it’s because I was entirely exhausted or if I have just overcome my insane fear of heights, but when I started climbing down the metal bars to the plank walk, I found myself at peace. The walk itself is always crowded. First you climb down some metal bars, in a crevice in the side of the mountain, to this little platform area where you can rent a harness. After renting the harness, you’re clipped into the walk, and you head out onto the planks. A little ways out, you’re met by a photographer, just chilling on the ledge, waiting for customers. He had a whole business see up on this tiny little platform, taking pictures and printing/selling them to customers on their way back from the other end of the plank walk. As I walked the planks, hugging the side of the mountain, I heard the girl in front of me crying and saw other Chinese people tempting fate by swinging half of their bodies off of the planks for death-defying pictures, showcasing their bravery. I continued to hug the mountain, daring to let go for photos and videos of this INSANE experience. With a huge smile on my face from the excitement I made it to the other side of the walk. There wasn’t anything especially interesting on the there side, just a Taoist temple. So, I headed back for the planks to make my way back to the South Peak. I walked back, and over the people coming towards the unexciting end of the walk. While walking back I asked the girl behind me to take a picture of me hanging off the edge, but she ended up giving the camera to a middle aged man who had asked to take a selfie with me earlier- a request to which I had responded with an angry scowl and an exhausted no. Welp, he ended up taking a picture of me anyways lol. After getting back to the South Peak, I decided to head back to meet up with Ivy. I was ahead of schedule by a couple of hours, but I was also insanely hungry and I figured if I started heading back now I would have enough time to grab a lunch before being taken to the train station for my train to Chengdu. I met up with Ivy, who was impressed by my quick return, and told me about her various conversations with other tour guides and how she had finished an entire bag of pumpkin seeds because they were too heavy for her backpack. Ivy was such a sweet little lady, and she treated me like her own daughter (who was actually around my own age), but in doing so she was also a bit over bearing and made me feel concerned for myself from her fear for me as a solo female traveler. Ivy and I headed back down the mountain the same way we came up, we took the lift down to the busses which we took back to the tourists center where we met up with our driver. Then we drove back to Xi’an, where our driver had her husband meet up with us to take over. 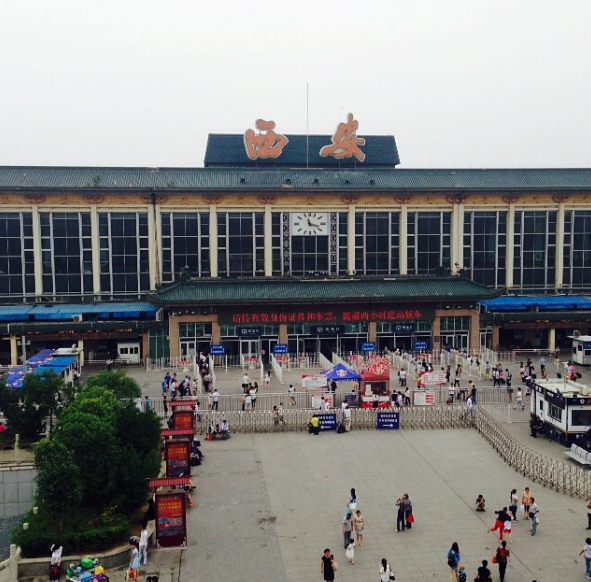 She wasn’t familiar with the South Xi’an Railway Station and needed his help taking us there. I didn’t realize this but the South Xi’an Station is actually really far outside of the city and it was falling apart. The driver and her husband dropped me and Ivy off at the station, and instantly I was being stared at by the squatters outside the decrepit station. Ivy took me into the building and helped me talk to the ticket person about switching my ticket from a hard seat to a sleeper ticket- I desperately needed the sleeper ticket seeing as this would be an overnight ride. No extra sleepers were available according to the system, so Ivy and the ticket man recommended that I keep my ticket, get on the train, and ask the conductor to switch my ticket because they may have extra sleepers on the train that weren’t recorded by the system. I decided to go along wth their plan, only one problem, we were EXTREMELY early for my train and I was going to have to wait outside with the creepy squatters who were starring and taking pictures of me. With a panicked look, I asked Ivy if there was somewhere else I could wait and she took me to a tiny cafe where another Chinese girl was also waiting for the same train. The girl didn’t understand English, but Ivy told her to take care of me. After exchanging numbers, I sent Ivy off to catch a bus back to the city, and then I waited. Thank God that I had that other girl in the cafe with me. I was able to talk to her using google translate, and she helped me get onto the train and switch my ticket. People still stared at me, curious of the dark-skinned, female, foreigner, yet I felt incredibly more comfortable with a friend. When I got on the train I was separated from my friend and was sent back into uncomfortable territory. The sleepers on this train were filled with middle age men, staring at me as I walked through the cabins to my sleeper. When I got to my number, I showed the men sitting down next to my bed and they pointed me to my hard sleeper, watching me as I crawled into my bed and put my stuff on the shelf above the hall. These two men happened to be sleeping on the beds above me (I was in the middle bed), and I fell asleep, hyper aware of their eyes watching me from above all night long. I woke up the next morning to the same men, with their eyes still fixated on my bunk. I quickly slipped out and towards the bathroom where I brushed my teeth and freshened up before mustering up some courage to head back to my bed. I sat on the seat in the hall instead of crawling up into what had become a zoo cage to me. Yet, even sitting in the hall, I attracted a strange sort of attention, as men sat in the beds and seats around me, simply watching me, smiling, giggling, and chatting with one another about me. The icing took the cake when one man sat in the seat directly across from me and just kept staring directly at me. With little distance between us, it was difficult for me to avoid eye contact, yet I did in hopes of him taking the hint and moving away, yet he didn’t. I moved and sat on the bottom bed, right under my bed. The two beds under mine were being habitated by two young Chinese women, whom I hoped would be friendly towards me, yet I think hearing what the men around us were saying, they chose to stay away from me out of fear of attracting attention towards themselves from contact with me. Even after moving away from him, the same man who had been sitting across from me, moved to a seat in front of the bed I was sitting in, continually watching me and even daring to pull out a cell phone directly aimed at taking a picture of me. Homie was not getting the hint- even from my stone cold, YOU’RE MAKING ME UNCOMFORTABLE, B**** face. As soon as the train stopped, I couldn’t have ran out of there faster. Yet, getting out of the train station and heading to the designated Taxi section wasn’t any better. As soon as I went to get a taxi, twenty or so taxi drivers crowded around me, pulling me by my sweater and backpack to get into their taxis, and laughing as I frantically ran away looking for a driver inside of a taxi willing to take me to see the Pandas. With little luck, I found myself showing a taxi driver the google translation for “Chengdu International Airport.” The taxi driver saw what was happening and quickly let me into the car before driving away from the chaos, and stopping a little ways away to double check my translation and make sure he was going to the right place. He took me directly to the airport and I ended up spending the entire day waiting for my flight to Jiuzhaigou. Honestly, at this point in my trip, I was done. I was texting Chris, Michael, my roommate from NYC- Jess, and my twin brother- Praveen, freaking out about the recent events and really just feeling unsafe. I was really tired of being stared at. I felt uncomfortable. I was an attraction for them, everybody watching and taking picture of the dark skinned, Indian-American, solo-female traveler. This was definitely the low point of my trip, and I am so thankful that all of my friends convinced me to keep going, even though all I wanted to do at this point was jump on a flight back to Shanghai. Even if you decide to travel a country by yourself, make sure you have some sort of support network of people who understand where you are physically and people who understand you as a person, to keep pushing you, keep encouraging you, and ultimately keep you going. I literally would not have made it to the end of my trip if it wasn’t for my network and I am so thankful I made it to the end. I boarded the plane and headed to Jiuzhaigou where I was picked up by a taxi driver set up by the hostel I was staying at. Getting off the plane, I was greeted by the cold crisp mountain air (very different from the apple weather app’s promised 70-80 degree weather). As we drove through the rainy mountains, I knew I had made the right decision in continuing my trip. The beautiful tibetan flags lined the peaks and valleys, with the clouds were weaving in and out. We drove through the stormy weather and I was reminded of Stranger Things- but like in the best way possible. When we got to the Tibetan Barley Inn, I was greeted by helpful and friendly staff. Although they didn’t know much English, they were great in directing to my room and making me feel comfortable. My room had a heated bed and I was so excited for a warm, safe, single room and a good nights rest. I started my first day in Jiuzhaigou with the hostel’s free breakfast. The food is specially prepared for each guest, who requests what they want the night before from a set menu. The hostel itself was a very small and cute Inn, with a pretty eclectic clientele. I ate my breakfast by myself, an oatmeal made with locally produced Yak yogurt, peacefully basking in my beautiful surroundings. The hotel staff asked me if I planned on going to the national park (Jiuzhaigou) today, and after discussing the options, I conceded to their plan. They called a free taxi, and put me in the cab with two Indian girls who were also staying in the Inn. I asked them where they had come from and what they were doing in China. Ruhi and Anusha are Theater/Production coordinators in Bangalore. They had just finished a set of intense shows and decided to take a couple weeks off for vacation. They had originally planned to go to South Korea, but when they saw that all the flights there from India included a layover in China they figured, why not just visit China? And so they did, starting in Beijing then to Xian, Chengdu and finally Jiuzhaigou- essentially taking the same path that I had! When we got to the park, our taxi driver dropped us off and we were left on our own. I had though that the taxi driver would be driving us through the park, but this wasn’t that kind of a park. This was a national park and similar to Mt. Huashan, there were a series of buses and paths for tourists to hike and see the sites. Lucky for me, Ruhi and Anusha had discussed their course of action with the hotel manager, Lily, who spoke fluent English. So, I tagged along and followed their plan, spending the day wandering through the park and following the winding paths over the lakes, through the woods, past waterfalls, and basking in the unbelievably blue views. Spending the whole day in the park, I quickly wished I had bought the packed lunch at the hostel to take with me on my journey. I ended up buying snacks at one of the stalls in the park for insanely cheap, but it wasn’t real food. I was quickly exhausted, and after some time I think Ruhi and Anusha noticed it. We made it to the second to last lake on the path, when we decided to get on the bus and head back to the exit, passing the last lake on our way out. At the exit, Ruhi and Anusha hailed a cab for us to take back to the Inn. They were great at haggling and dealing with the cabby. Once back at the Inn, the pair went to shower and freshen up, while I went and ate like three meals at once. The night before Day 13, I spoke with Lily (the English speaking manager in the Inn) about getting back to Chengdu. I didn’t want to book another flight because they were expensive compared to the bus which I’d read about online. Lily offered the carpool service, noting that it was as cheap as the bus, but that it would get me to Chengdu faster so I could catch my flight that evening back to Shanghai. She was even able to convince the carpool driver to take me to the airport directly for an extra charge. I woke up, got ready, had breakfast, bought a lunch to go and was off in the carpool headed back to Chengdu! The carpool was a mini van with all the seats filled. The driver, and a front seat man, me and another girl in the middle, and three older men in the back. Everyone was fairly curious about me, but it wasn’t a creepy/uncomfortable curiosity, when they realized I didn’t understand them, they all backed off and simply did their own things. The car ride was super nice and peaceful, and I really enjoyed being able to drive through the Chinese country side and see the scenery. We even had a lunch break included in the price of the carpool! Overall, this was my favorite mode of transport this trip. Unfortunately, when I got to the Chengdu airport, my flight to Shanghai (and every other one for that matter) was cancelled. The weather in the city was bad so no flights were going in- Chris had been waiting for two days in Guangzhou for his flight back to Shanghai after his trip to Vietnam! When the airport staff said I would have to wait overnight for another flight, I was not having it. I literally knew nobody in Chengdu, and zero idea of where to stay for a night, and remember what happened last time I was in this city? With the cab driver mob? nuh-uh, I was not staying here for a whole night. After fighting with the airlines, they switched me to another flight, leaving the same night at 11pm. This flight was with a different airlines that provided a hotel for it’s patrons, so I was bussed out to a random hotel in Chengdu and told to wait in my room till news came about my flight. Luckily, my roommate was a Chinese girl who spoke fluent English, and she took me out for Lunch as we exchanged stories about our recent adventures. She had just come from a snowy mountain in the North West of China and was headed back to Shanghai where she lived and worked. She really wanted to get back to Shanghai soon so she could go to work the next day. Lucky for us, our flight was only postponed till 12am and we were able to go straight to Shanghai that very night! After I got back to Shanghai, I only had one more day in the city. I spend the whole first half of that day sleeping out of exhaustion from all of my traveling, then I went out souvenir shopping and wandering Tianzifang with Rebecca and Henry- both from the hostel in Beijing! I then spent the rest of the night getting street food with Chris, and catching up with him about both of our adventures. The next day, Chris and I said our goodbyes, and then I was off to the airport back to New York. Honestly, sitting back in New York and writing about all of this is insanely surreal. Since my trip, I have gone back to my life in the city- working on campus at NYU, meeting up with friends, doing photo shoots. This trip all seems like a dream, a distant memory. Yet, it was literally less than a week ago that I was traveling across China by myself with just a backpack full of what I thought would be essentials. Overall, this trip was incredible and it made me really love traveling, seeing different places, experiencing unique things, and really just having an adventure. Yet, it also made me extremely conscious of the fact that I need to be more aware of the culture of the place I am traveling in. It also made me extremely aware of the fact that I get anxious when I attract unwanted attention, so much so it can be crippling for me. When I set out on this solo adventure, I expected it to be my Eat, Pray, Love adventure, filled with positive revelations. Yet, I found out that learning what scares you is an important part of adventure as well. Ultimately, this was an amazing experience and I am so thankful that I had it and am able to share my thoughts with you! If you are planning on backpacking China, or are a solo female backpacker looking for some encouragement- YOU CAN DO THIS– I hope this piece helped!